Skill enhancement: why should executives join your classroom training at the first place? They want to know how a particular training can help them acquire in-demand skills. Remember, they already have a particular skill set. A small weakness in training can turn them away. Improved Knowledge: a well-designed training program may prove to be ineffective if it consists of outdated or obsolete information. If your training program is focused on certain industry, it must have latest industry-specific facts and figures, as well as your own input as a trainer. If it’s a general purpose training focused on particular skill-set, you need to provide latest information as to where this skill or knowledge can help them in their niche. Executives are smart and can understand complex information reasonably quickly. They have a broader attention span as compared to average person. Just take a look at their daily routine. The entire work-day executives spend in meeting, brain storming, planning, implementing and more. In these meetings, executives have to go through complex information that others have spent weeks to prepare. They’re expected to make quick decisions and suggest necessary measures. Can you expect them to slow down the pace? You cannot take them out of their comfort zones by spending too much time. If you try to slow down the pace, they’ll tell you to pace it up by waving their hands. “Come on! Move to the next topic”. This is where you need to be very careful. Include as many different examples as possible, to let them understand why going deep into the topic holds importance. Ask questions and find out how much they understand. Training room rental provides modern-day equipment to help you add variety of activities and examples to emphasize on certain topics. Training content must be proactive, sophisticated, fresh and relevant. Executives will evaluate how they can achieve their business objectives in the lights of what they’re being trained for. Apart from a few of them with intellectual curiosity, most will consider immediate relevance to their business or they’ll be less attentive. They’ll show you instantly that their time’s being wasted, by taking out their phones and mobile devices. One major thing to understand is, executives don’t want you to spoon feed them. They don’t like to be instructed. They are free to make their own decisions, their own rules. So, instead of making rules for them, your training should challenge them and see how they can utilize what they learnt to find out the best solution. Executives have competitive nature. So, the rules of “Safe learning environment” are out of question. Don’t waste your time establishing relationships, they can do it on their own because they’re quick to judge. 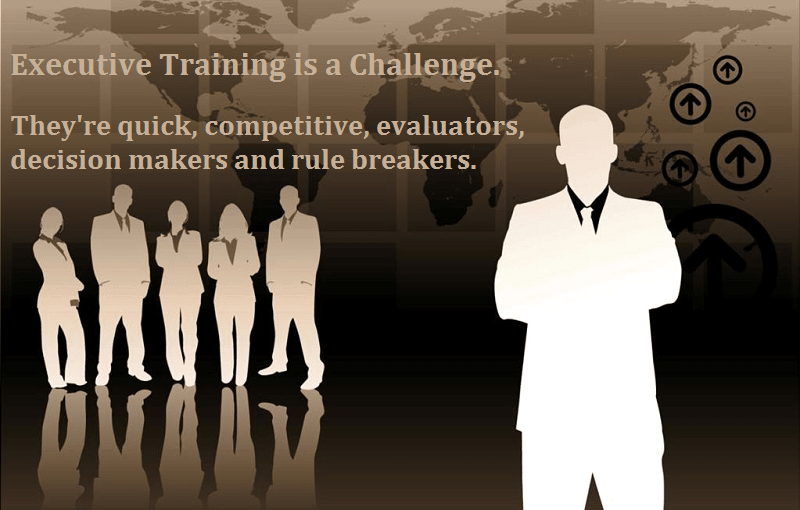 Executive training should consist of latest information, unique and relevant skill set, challenges and difficult scenarios. If you intend to get a seminar room for rent, make sure it has everything to impress all of them. This entry was posted in General and tagged executive training, training on August 30, 2015 by .